by Lee Pfeiffer and Michael Lewis. Recently republished after being revised and updated to include films such as Air Force One and Six Days, Seven Nights, this book now represents, more than ever, an extraordinary encyclopedia of the works of Harrison Ford. From Dead Heat on a Merry-Go-Round through to the enhanced Star Wars Trilogy Special Editions, the authors examine Ford's life and movies in minute detail. Even the 1994 Joe Pesci/Christian Slater movie Jimmy Hollywood has five pages of fascinating material due to Ford's unbilled cameo during the movie's conclusion. A treasure chest of knowledge, the book should not be limited to Harrison Ford fans and deserves a place in any movie-goer's collection. Even Ford's lesser known films receive in-depth attention. The intriguing story of the making of The Mosquito Coast for example is told in much detail over seven pages of text and photographs. One person who did not share Ford's enthusiasm for the role was his longtime agent Patricia McQueeney. She told the Hollywood Reporter in a 1994 interview, "[Ford] says, 'I'll do these other films, but once in a while I've got to do one for me.' He loved what his character, Allie Fox, had to say. Harrison is very much into the environment and antipollution and all of those good things that Allie Fox was also into. But what I didn't like was the torture that he puts his wife and his kids through. And I said, 'The audience thinks you're a hero. They aren't going to want you to be this mean guy who drags these people through the jungle.' We often have friendly fights, friendly arguments, but with that one we really had a knock-down-drag-out!" The fictitious town of Jeronimo, which Allie Fox develops from a few shacks into a thriving community, had to be constructed from scratch. Interestingly, in the course of doing so, the crew unearthed an unrecorded Mayan temple - a discovery that would have made Indiana Jones proud. The $7 million which the producers invested in the local economy made the film company the third biggest industry that year in Belize (following sugar and marijuana!). Over three hundred citizens were hired to build roads, carry supplies, and transport the all-important dailies. Practically every page is generously illustrated with both color and back-and-white photographs - a collection of both official publicity shots in addition to rare, behind-the-scenes photos from the various movie sets. 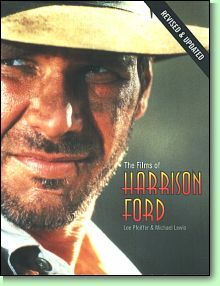 River himself is featured in his Boy Scout outfit when the book documents the movie Indiana Jones and the Last Crusade. The film also features River Phoenix as the teenaged Indy in a superb opening sequence. The scenes, which feature Indy as a boy-scout trying to prevent the theft of a sacred artifact by scavengers in a deserted gold mine, is a marvel of flawless screenwriting, directing, and editing. Indy's battle with the thieves takes him from inside the mine, to a chase on horseback, to a cat-and-mouse game aboard a circus train loaded with deadly animals. Within a few precious minutes, the scene manages to explain the origins of everything from Indy's fear of snakes to his acquisition of his trademark Stetson hat. The sequence beautifully segues to twenty-six years later, when we see a grown Indy once again caught in a life-and-death struggle to save the same artifact. Previous Page Click here for advice on obtaining this title.